Still more bumps in the road, were the words used by the former treasury secretary Jack Lew regarding the US-China trade deal. Still, if no agreement is reached soon, the US has warned it will up the tariffs from 10% to 20% on the 200 Billion dollars’ worth of trade. A hit to US based company Boeing today as their European rivals Airbus has received a large order of 300 passenger jets from China. Is this a statement to the US? This deal could be worth in excess of 35 billion dollars – which could have been allocated towards the US-China trade deal. Most of the major Asian stock markets had a green day on Tuesday: NIKKEI 225 increased 451.28 points(2.15%) to 21,428.39; Hang Seng increased 43.56 points (0.15%) to 28,556.91; ASX 200 increased 4.40 points(0.07%) to 6,130.60; KOSPI increased 3.94 points(0.18%) to 2,148.80 and SENSEX increased 424.50 points(1.12%) to 38,233.41. However Shanghai took the opposite route decreased 45.94 points(1.15%) to 2,997.10 . The major Asian currency markets had a green day today: The AUDUSD increased 0.0030 or 0.42% to 0.7141; The NZDUSD increased 0.0008 or 0.11% to 0.6913;The USDJPY increased 0.5760 or 0.52% to 110.5260 and The USDCNY increased 0.0058 or 0.09% to 6.7225. Both Gold and Silver had a negative day today: Gold decreased 6.49 USD/t oz. or 0.49% to 1,314.68 and Silver decreased 0.11 USD/t. oz or 0.71% to 15.43. Still some surprise in the house of commons as the UK parliament took over the control of the Brexit process from Theresa may. This is the first time on over a century when the Parliament took control over the government. MPs voted 329 to 302 in favor of an amendment giving them control of Parliament’s agenda and deciding other routes for the split with the European Union. In North Africa, Algeria a country with 41 million people. Algerian politics has been known to have dual power shared between Government and the Army. The Army chief today has told the population and the President that he is unfit to rule, which is good news to the population as it means that usually disaster can be avoided when the Army is backing the side of the people. The voice of the people and weeks of peaceful protest seems to be answered. However the ailing President is yet to step down – as he recently agreed to not run for a 5th term. Originally elected 20 years ago, the general population believe that President Bouteflika is being used by unknown businessmen to take control over the country. They call this group of business men “the power”. Algeria is a wonderful scenic country with a young and eager population to help the country grow, but are dissatisfied with the ongoing corruption of the political system. Many young professionals move to Europe in search for a career, as there are little in the way of opportunities in the country. Unemployment in Algeria currently stands at 29%. The ex-PM who recently stood down, said the “the situation in Syria also started with roses” – indicating the current peaceful situation could turn ugly. The major Europe stock markets had a green day today: CAC 40 increased 46.74 points or 0.89% to 5,307.38; The FTSE 100 increased 18.71 points, or 0.26% to 7,196.29 and DAX increased 72.83 points or 0.64% to 11419.48. The major European currency markets had a mixed day today: The GBPUSD increased 0.0020 or 0.15% to 1.3222 and The USDCHF increased 0.0011 or 0.11% to 0.9934, however the EURUSD took the opposite route decreased 0.0029 or 0.25% to 1.1283. 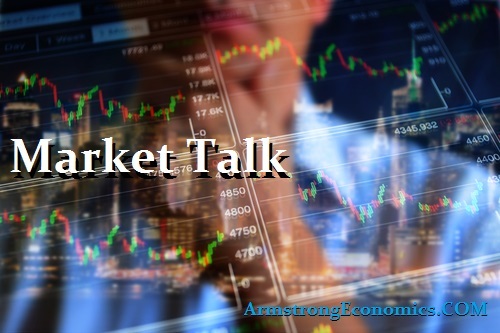 Following a relatively flat day in yesterday’s session, US equities were fairly strong across the board today – this despite “experts” continuously focusing on the so-called “yield curve inversion” and casting fear of an oncoming recession. On the economic front, U.S. homebuilding was down 8.7% in February, while consumer confidence also fell in March. But 30-year fixed mortgage rate has also dropped to an average 4.28%, which may help fuel buyers into spring season. Unfortunately, long-term investors can sometimes be swayed by day-to-day ramblings of financial news personalities who can sound amazingly positive one-day, and panicky the next, all based on how the wind is blowing (be it in Washington, Wall Street or Main Street). This drives ratings – and while it is good to stay well-informed from all angles, please do your own research to compare and contrast all sources of data and analysis so you can form an educated strategy of your own that is founded in solid examination. The Dow finished the day up over 140 points (+0.55%, 25657.73 close), but this was well off the highs of the day (up over 279 points). The S&P 500 closed up +0.72% at 2818.46 – but this too was well off its highs of the day. The Nasdaq Composite gained nearly 54 points on the day (+0.71%, 7691.52 close) while the Russell 2k had the strongest day of the major US indices, closing at 1528.17 (+1.01%). In Canada, the TSX Composite (+0.56%, 16155.16 close) and TSX 60 indices (+0.59%, 961.89 close) both finished strong. Brazil’s Bovespa had a rather strong bounce back today, closing up over 1644 points (+1.76%). There is a few things a play here with the oil markets. On one hand the economic health of the globe, with an economic slowdown occurring in recent months. And on the other, the supply with the hit of sanctions on Venezuela and now the OPEC squeeze. Today the market seemed to think that the supply is more of a pressing issue as WTI traded over 60 USD a barrel today. Crude and Brent also both rose today as the announcement of the OPEC cutting their supply. The most of major energy markets had a green day today: Crude Oil increased 0.93 USD/BBL or 1.58% to 59.6802; Brent increased 0.51 USD/BBL or 0.76% to 67.8576; Gasoline and Heating oil increased 0.0191 USD/GAL or 0.99% to 1.9603 and 0.0025 USD/GAL or 0.13% to 1.9801 respectfully. However the Natural gas took the opposite route decreased 0.017 USD/MMBtu or 0.62% to 2.734. Top commodity gainers are Lumber (1.87%), Crude Oil(1.80%) and lean Hogs (1.02%). Biggest losers are Palm Oil(-1.26%), Rubber (-1.44%) ;Palladium(-2.16%). Japan -0.06%(+2bp), US 2’s 2.29% (-7bps), US 10’s 2.45%(-4bps), US 30’s 2.87%(-2bps), Bunds -0.01% (+1bp), France 0.37% (+2bp), Italy 2.50% (+4bp), Turkey 17.43% (+69bp), Greece 3.78% (+1bp), Portugal 1.30% (-1bp), Spain 1.12% (+3bp) and UK Gilts 1.01% (-3bp).